Redring talks to LABM about how the training support it offers is helping housing association Wakefield and District Housing to deliver a same day ‘repair not replace’ strategy. Since the stock transfer from Wakefield Council in 2005, Wakefield and District Housing (WDH) has invested more than £1bn in the area and is set to invest a further £100m in its housing stock over the next three years. Over the last decade, the housing association has installed Redring’s Selectronic Premier thermostatic electric shower as standard in over 15,000 of its properties, following its initial selection by the product forum team at the start of Decent Homes works. Low product failure rates and positive feedback from engineers and residents have resulted in the continued specification of Selectronic for bathroom adaptations and wetroom upgrades in independent living schemes. 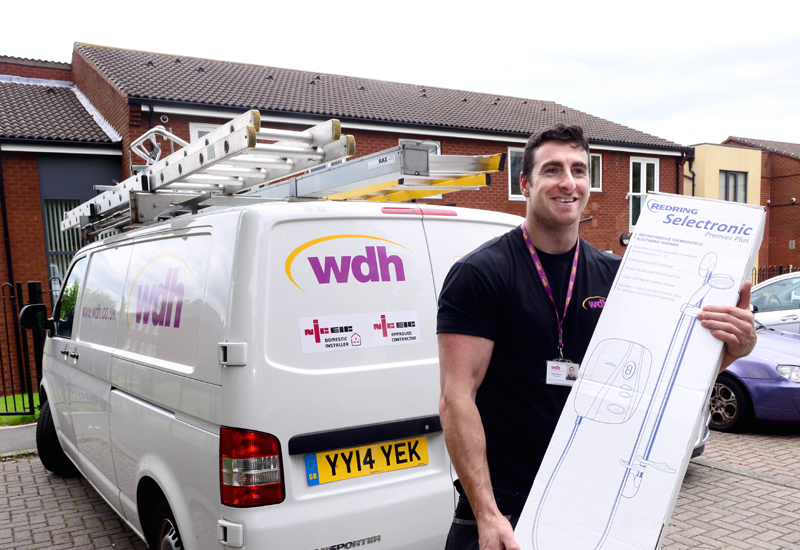 Key to the ongoing relationship between WDH and Redring has been the training support provided by the Peterborough-based manufacturer of electric showers and instantaneous water heaters, which has helped WDH to achieve its goal of extending same day repair services to cover more categories, including electrical and plumbing. In January 2016, the manufacturer delivered a series of practical half-day training workshops for WDH’s newly expanded team of 20 maintenance engineers, exploring the features and benefits of Selectronic, with a real emphasis on its self-diagnostic and fault-finding functionality. Redring Training Manager Craig Cundey explained: “If there is a problem within the Selectronic, an engineer can easily diagnose what the fault is by accessing the shower’s diagnostic mode. The training course teaches engineers how to use this feature, which will allow the engineer to test the internal components and identify the faulty item. This makes the whole process of diagnosing and solving problems incredibly swift and efficient. For WDH, the workshop scenario presented a great opportunity for engineers to get hands-on with the shower and was available to newer employees, as well as existing members of the team as a refresher course. “The training allowed our engineers to familiarise themselves with the unit’s fault mode and codes, so they can identify and fix any issues out in the field more quickly,” said Jamie Burton, electrical operations manager for WDH. “The self-diagnostics are hugely popular with our engineers, as they reduce the need for technical interrogation of the shower units, which obviously saves time and minimises hassle for residents. Such an approach can be especially critical for properties with level access wetrooms, where the shower unit is often the only means of bathing. “First-time fix is clearly a crucial KPI for WDH across its entire housing stock, but the implications of not achieving this for showering faults can be more serious for older residents and those with disabilities,” explained Alex Wilson, Key Account Manager for Redring Xpelair Group. “If the shower is out of action for any period of time, this can be both inconvenient and distressing for residents, with health issues potentially developing as a result. By training engineers to make better use of Selectronic’s in-built diagnostics, problems can be swiftly resolved on the same day. Redring delivers training courses for housing associations and local authorities nationwide, either on location or at its Peterborough client centre. A-rated for energy efficiency, the Redring Selectronic Premier range of thermostatic showers has been trusted by care professionals for over 25 years and has been developed in conjunction with BEAB Care and RNIB, in line with Equality Act guidelines.